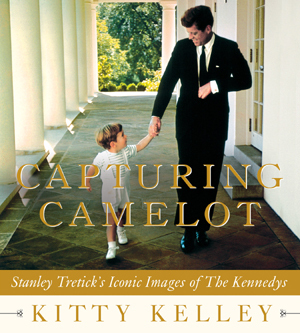 Capturing Camelot: Stanley Tretick’s Iconic Images of The Kennedys, with text by Kitty Kelley and photos by her late friend Stanley Tretick, will be published in November 2012 by Thomas Dunne Books. “Capturing Camelot springs from unbounded affection: mine for Stanley and his for John F. Kennedy. Yet it’s a departure for me as a biographer, one who usually tries to pierce a public image to find the person hiding behind an established myth. In Capturing Camelot, I’m celebrating one of America’s most cherished mythologies and the photographer who helped to create the magic that fuels the nostalgia for those fresh mornings and gilded evenings of long ago. More on Capturing Camelot here. Update, June 2012: Kitty Kelley spoke about Capturing Camelot to Publishers Weekly. Update, November 13, 2012: Article and slideshow at USA Today; Kitty Kelley and Capturing Camelot on the Today Show. Update, November 14, 2012: An excerpt from Kitty Kelley being interviewed by Joy Behar November 13; Kitty Kelley on Jansing & Co.; Kitty Kelley on Starting Point. Update, November 16, 2012: Kitty Kelley on Fox 25 (Boston). Update, November 25, 2012: Kitty Kelley on HLN Morning Express. Update, November 26, 2012: Podcast, Kitty Kelley on Conversations with Kim Carson. Update, December 12, 2012: Kitty Kelley on The Bill Press Show. Thanks to Kitty Kelley’s labor of love, Tretick takes his well-deserved place alongside David Hume Kennerly and Yoiki Okamoto as one of the greatest of great Presidential photographers. Abandoning the usual formalism in political images, Stanley Tretick managed to capture all the energies, brilliance and yes, fun within this cherished, all too brief period in our history. This is an example of how books are sometimes far more than paper and ink, rather they can be the product of dedication and love. To look at these photographs so many years later not only demonstrates the mastery of Stanley Tretick but transports one back to an era filled with problems (war, racism) but so full of hope and promise. Do yourself a favor. Buy this book for yourself, but be sure to buy copies for someone younger.